Last month, Tanner Bell from A Little Craft in Your Day visited me and my team. 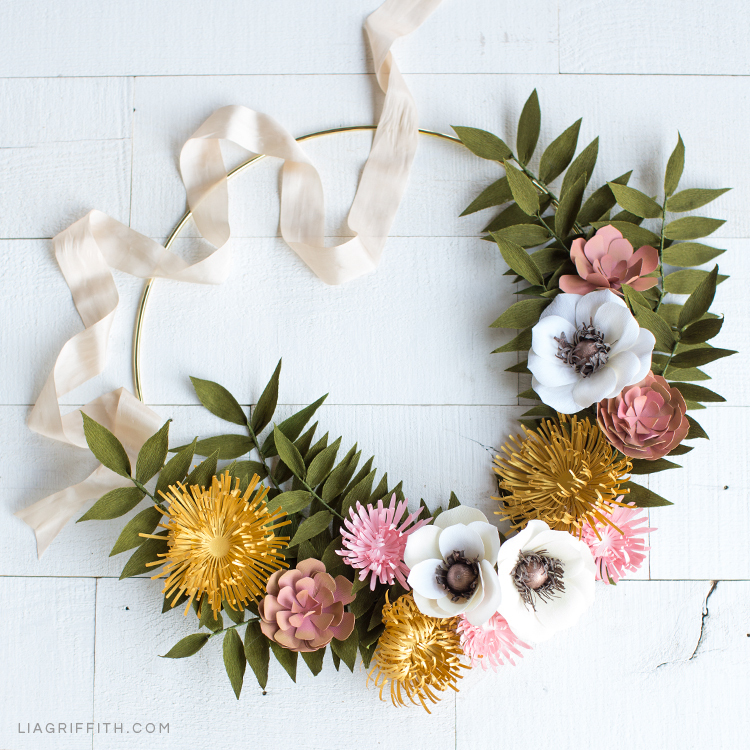 We had so much fun together—including making this gorgeous paper flower wreath for fall! One of the great things about DIY projects is reusing them in new ways. This wreath is actually a combination of several different projects. We used my pom-pom billy ball wreath (minus the billy balls) as well as the flower patterns from my crepe paper anemone, fall spider mums, paper spider chrysanthemums, and succulents. You can give your DIY crafts a whole new look just by changing the color of the paper you use. Trying a different material can also be a fun way to switch things up. For this project, I took patterns from some of my other projects and used different colors to create the anemones, mums, and succulents you see here. Since this is a paper flower wreath for fall, I chose shades that are perfect for the season. Pink and saffron also happen to be very trendy! Plus I just love them. To help you get started on your paper flower wreath for fall, I listed all the tools and materials I used as well as the steps to follow. You can also watch my video below. 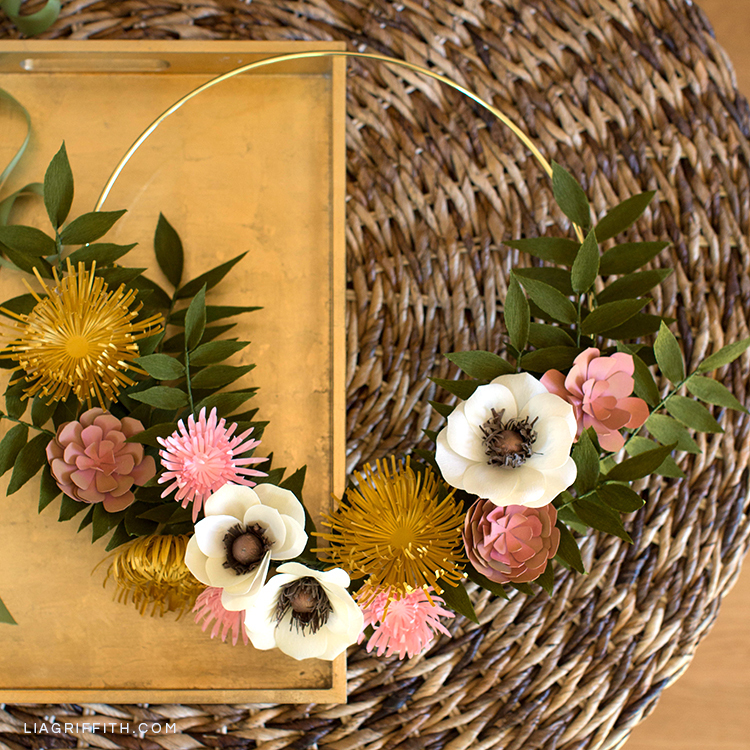 In this video, I show Tanner how to make the anemones, mums, and succulents for this wreath. I also share some tips as we transform our paper into flowers. I hope you have as much fun making this as we did! 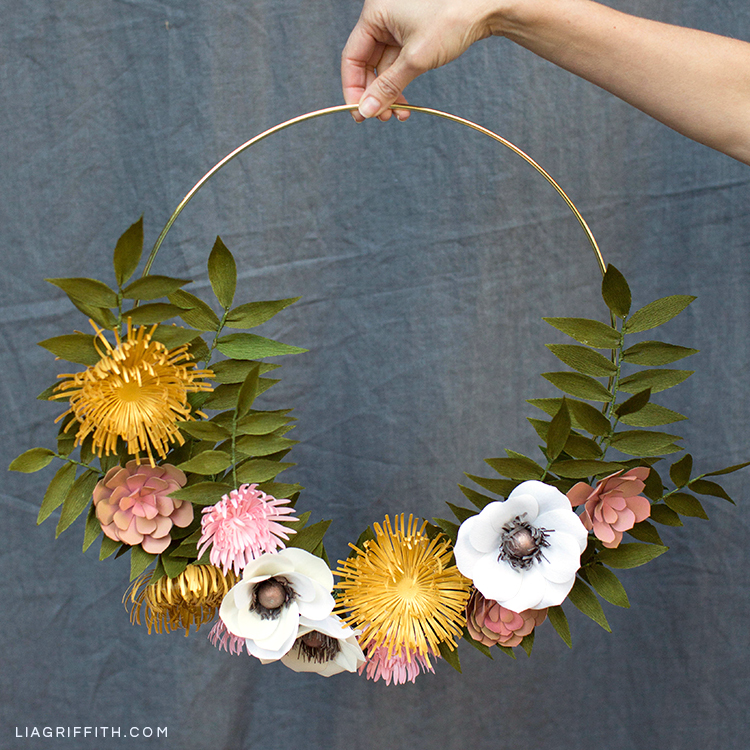 To make your own paper flower wreath for fall, gather the tools and materials above. If you’re using a cutting machine, scroll down to download your SVG cut file. Using scissors? Download the PDF template. Both of these files have all of the patterns you need to make this wreath. 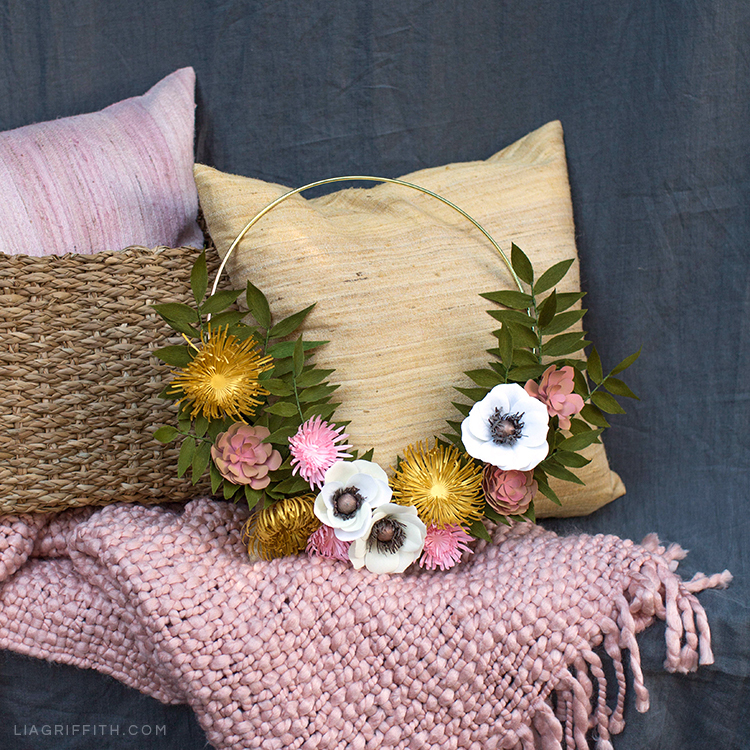 Then follow each tutorial below to make your greenery, anemones, mums, and succulents. The first tutorial will show you how to make the greenery and attach it to your hoop. From there, you can add your paper flowers. You can also watch the video below and craft along with me and Tanner! How to make the crepe paper greenery and attach it to your hoop: Follow steps 1–10 in this tutorial. 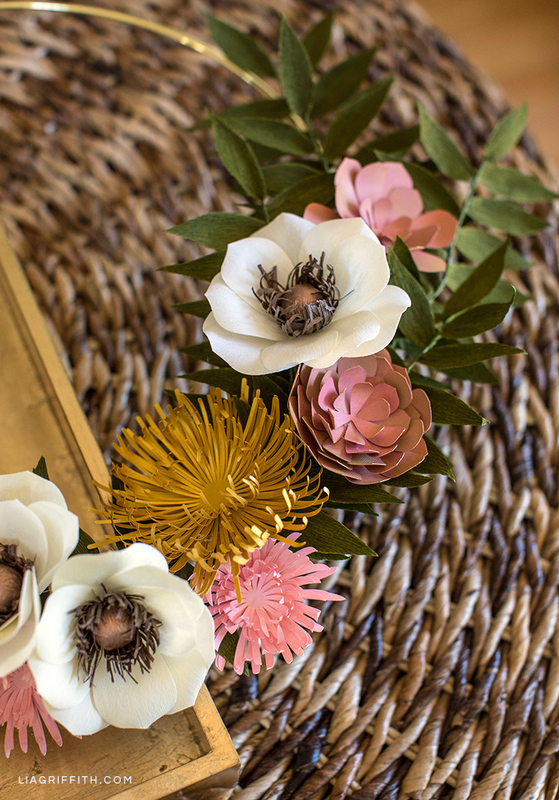 How to make the crepe paper anemone flowers: Follow steps 1–11 in this tutorial. Note: For this anemone, I used Double-Sided Crepe Paper in White + Vanilla for petals, and Extra Fine Crepe Paper in Copper for the center. How to make the yellow frosted paper spider mums: Follow steps 1–4 in this tutorial. How to make the pink frosted paper spider mums: Follow steps 1–8 in this tutorial. Note: For this mum, I used Frosted Paper in Rose Quartz. How to make the pink succulent: Follow steps 7–10 to make “succulent 2” in this tutorial. Note: For this succulent, I used Cardstock in Rose. 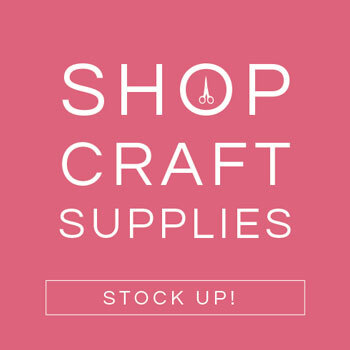 Join our crafting community and get access to our entire library of high-quality DIY projects. 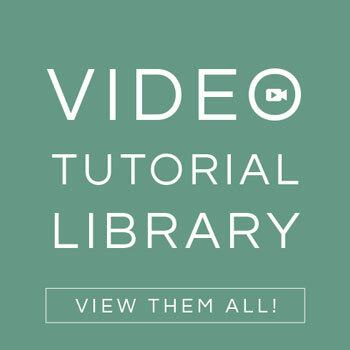 This includes SVG cut files, PDF templates, and step-by-step tutorials to make your own flowers, jewelry, home décor, and more. 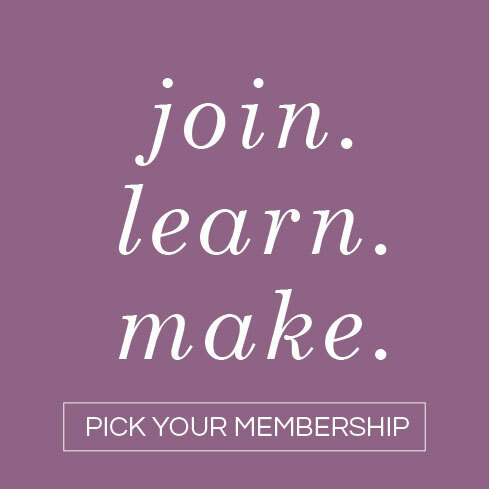 Explore our two membership options and see which one is right for you!